The high performance storage tier is where all the important and frequently accessed data, such as the partition holding our Q1 orders, is stored. This tier uses smaller, faster disks on high performance storage devices. The low cost storage tier is where the less frequently accessed data is stored, such as the partitions holding the orders for Q2, Q3, and Q4. This tier is built using large capacity disks, such as those found in modular storage arrays or low costs ATA disks, which offer the maximum amount of inexpensive storage. The online archive storage tier is where all the data that is seldom accessed or modified is stored. This storage tier is likely to be extremely large and to store the maximum quantity of data. You can use various techniques to compress the data. Stored on low cost storage devices, such as ATA drives, the data would still be online and available, for a cost that is only slightly higher than storing this information on tape, without the disadvantages that come with archiving data to tape. If the Online Archive storage tier is identified as read-only, then it would be impossible to change the data and subsequent backups would not be required after the initial database backup. The offline archive storage tier is an optional tier because it is only used when there is a requirement to remove data from the database and store it in some other format, such as XML on tape. Figure 5-2 illustrates how data is used over a time interval. Using this information, it can be determined that to retain all this information, several storage tiers are required to hold all of the data, which also has the benefit of significantly reducing total storage costs. After the storage tiers have been created, the data classes identified in "Step 1: Define the Data Classes" are physically implemented inside the database using partitions. This approach provides an easy way to distribute the data across the appropriate storage devices depending on its usage, while still keeping the data online and readily available, and stored on the most cost-effective device. You can also use Oracle Automatic Storage Management (Oracle ASM) to manage the data across the storage tiers. Oracle ASM is a high-performance, ease-of-management storage solution for Oracle Database files. Oracle ASM is a volume manager and provides a file system designed exclusively for use by the database. To use Oracle ASM, you allocate partitioned disks for Oracle Database with preferences for striping and mirroring. Oracle ASM manages the disk space, distributing the I/O load across all available resources to optimize performance while removing the need for manual I/O tuning. For example, you can increase the size of the disk for the database or move parts of the database to new devices without having to shut down the database. After the storage tiers have been defined, the data classes (partitions) identified in Step 1 can be assigned to the appropriate storage tiers. This provides an easy way to distribute the data across the appropriate storage devices depending on its usage, keeping the data online and available, and stored on the most cost-effective device. 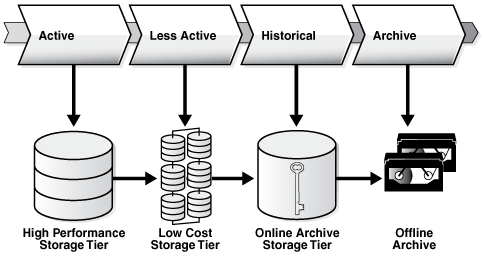 In Figure 5-3 data identified to be active, less active, historical, or ready to be archived is assigned to the high performance tier, low cost storage tier, online archive storage tier, and offline archive respectively. Using this approach, no application changes are required because the data is still visible. Description of "Figure 5-3 Data Lifecycle"
One benefit of implementing an ILM strategy is the cost savings that can result from using multiple tiered storage. Assume that there is 3 TB of data to store, comprising of 200 GB on High Performance, 800 GB on Low Cost, and 2 TB on Online Archive. Assume the cost per GB is $72 on the High Performance tier, $14 on the Low Cost tier, and $7 on the Online Archive tier. Table 5-1 illustrates the possible cost savings using tiered storage, rather than storing all data on one class of storage. As you can see, the cost savings can be quite significant and, if the data is suitable for OLTP and HCC database compression, then even further cost savings are possible.